ID Edge Inc., a security products supplier, introduces a convenient way for facilities to improve security and better manage membership activities. 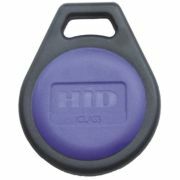 The HID Contactless Smart Key (or key fob) is the modern-day replacement for ordinary membership cards. Unlike cards of the past, key fobs are programmed with features unique to your facility, like tracking time and access points, and even using two-factor authentication. National Ticket Company manufactures tickets and wristbands used for admission and crowd control, pay-one-price admission, security, special privilege passes, group identification, restricted area access and any application where a visual means of identification is needed. National Ticket Company offers bright colors and designs of stock wristbands made of Tyvek®, double-numbered stub wristbands, holographic, vinyl and plastic wristbands. In addition, National Ticket Company prints ultra high-res, RFID bands, sta-put tab bands, stub bands and Ultra Quik Wristbands. With a long-lasting lithium-ion rechargeable battery and built-in charger, AmpliVox's lightweight, plug-n-play automatic recharging megaphones run up to eight hours on a single charge and hold their charge while inactive for virtually an unlimited time. AmpliVox megaphones include a unique battery power indicator ensuring the company's "never run out of power" guarantee. Megaphones also run on regular c and d cell batteries. 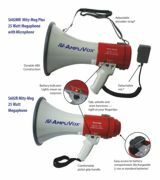 AmpliVox megaphones are also versatile for all types of athletic, recreational, school, military and large-group activities. SportaFence™ is a professional-grade portable fencing system. While used primarily for sports fields, this new portable fencing system can also be used for crowd control and security. SportaFence is 5-by-10-foot or 6-by-10-foot interlocking panels constructed with galvanized steel frames and 8-gauge coated chain-link wire and with or without retractable wheels. This high-quality fencing system can withstand 80-mph winds and 500-pound impact. Additionally, portable security camera systems can be attached for surveillance. These High Security Fiberbands® have invisible designs that can only be seen under UV light. Wristband Specialty also carries a color-snap vinyl wristband that will stand out from anything your patrons might have kept from another event. They now also offer Glo in the Dark printable vinyl wristbands. Tabless® wristbands help prevent littering with fold-back tabs that stay attached and leave no mess behind. In the past 10 years, Wristband Specialty also has become a leader in Thermal tickets, which can be custom-printed the same day.